Nonhuman primates, like these Rhesus macaques, are naturally curious. They spend a great deal of time foraging and investigating novel objects in their natural habitats. 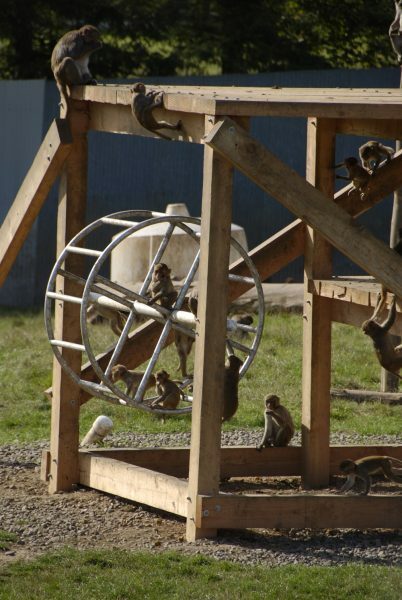 Environmental enrichment provides a way to simulate a natural environment for monkeys that are needed for research. This increases opportunities for the expression of species-typical behaviors such as foraging and exploration. The outdoor structure you see here allows the monkeys at the Oregon National Primate Research Center to perform many of their natural behaviors which include climbing, exploring, and socializing.